I have been asked over and over again "Can you show me how to use my camera?" or "What do the different settings on my camera do?" or "What do all the numbers mean?" As an elementary school teacher, I love teaching and sharing my knowledge, but I never have a quick answer to these questions. After a couple of years of people asking me for these types of classes, I am finally going to start offering photography classes. 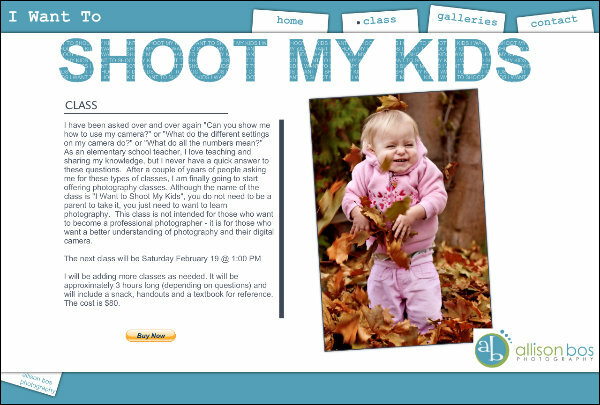 Although the name of the class is "I Want to Shoot My Kids", you do not need to be a parent to take it, you just need to want to learn photography. This class is not intended for those who want to become a professional photographer - it is for those who want a better understanding of photography and their digital camera. I will be adding more classes as needed. It will be approximately 3 hours long (depending on questions) and will include a snack, handouts and a textbook for reference. The cost is $80. To reserve your spot, click on the buy now button.